Christmas is almost here and the PacktPub has a great offer for you. 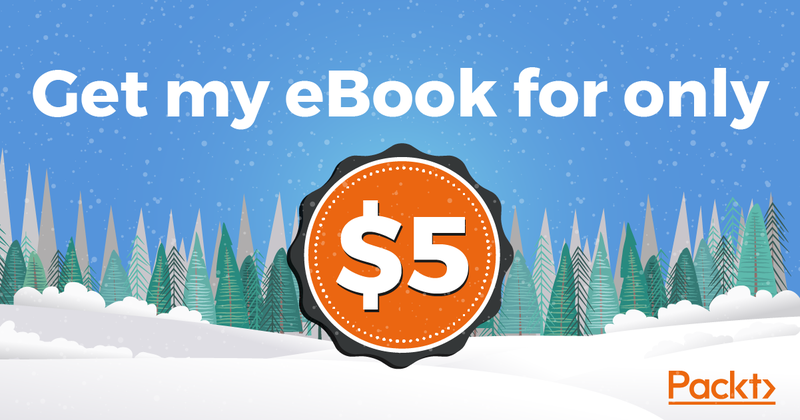 Every ebook, every video for only $5. Go and browse the latest titles and maybe you will find to books you will read the next year. The ESP8266 book is in the offer. Get it and start some new IoT project in the 2019! After the ESP8266 Home Automation Projects book was published, the wunderground.com service is not offering free services anymore, so the code presented in the Getting data from the internet part need to be reviewed. Go to openweathermap.org an create an account. After login you will find your own API Key that will be used later in the code. and check it in a browser. You should see the response in JSON format. 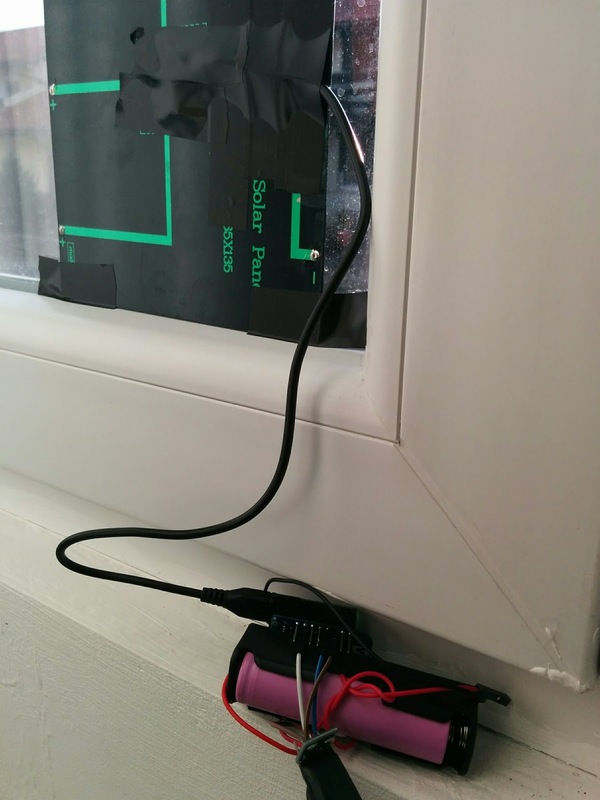 I encourage you to test the links first in browser and later on the ESP8266. To make use of the results you will need to parse the JSON response and extract the data you need. On my setup described in here I've added this solar panel from Banggood. If in the past the maximum of battery operated was around 48 days on one charge, now with the help from solar panel I am expecting to run 24/7 without the need to recharge the battery myself. The panel has dimensions 165x135x2mm and is made from monocrystalline silicon and is rated to 6W and 580 mA. Exposing it to full sun will produce 6.54 volts and after the diode (I've used a 1N4007) will have 6.00 V.
To connect the solar panel to charger board I've cut a USB to micro-USB cable and I've soldered the part with the micro-USB to the solar panel. The micro-USB cable now can be plugged directly into the charger in its micro-USB connector. BMP180 temperature and pressure sensor - 1pcs. The code is the same as in the original post in here. And the entire module with solar panel attached to the window. The entire module with solar power. Just after I've added the solar panel the voltage of the battery has start to increase. Now after few days you can see that what is consumed during the night and during the day when there is not enough sun will be recovered in few hour of sun. The panel is mounted to a window where is having sunlight for three four hours in the afternoon. In the next picture you can see four peaks (one every day), where the charger actually stopped the charging of battery. The charger is cutting the power to the battery at 4.26 - 4.27 V. You can see that by looking to the LED on the charger board that will light green. In the led is red it means that the charger is charging the battery. If there is not enough sun the led will be off which is good because will not drain the battery. Now it will run forever and I don't need to load the battery every 48 days. After a two days without any sun ( two days of rain) you can see that there are no peeks of fully charged. You can see this in the picture bellow. It will be interesting to see if the battery will be fully charged again in the next days with sun. As you can see in few hours with sun the battery is full again, recovering after a two cloudy days. The LED is green again now. I've let the module to work exclusively on battery for 10 days. I've reconnected the solar panel and in two hours the battery was again fully charged. I've been busy in the latest months writing a book to cover some key aspects of the ESP8266 ecosystem, the chip, the cloud and a mobile application. The book will teach you and will give you a ready-to-sell solution for an IoT product. 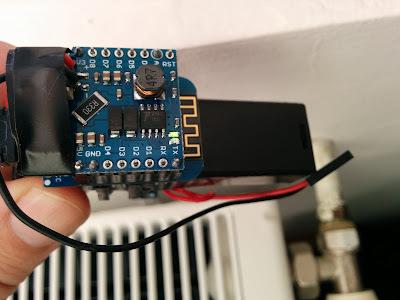 You will discover how to work with the GPIOs on the ESP8266, how to build your basic thermostat for your house, how to control it from your mobile with your own cloud system based on MQTT. Securing the data using authentication at the broker level and SSL is explained in a special chapter. Real-time communication has a dedicated chapter where you will learn how to send real-time data from an ESP8266 to an nodejs server. I hope that you will enjoy the book.